As filmmaker Oleh Sentsov continues his hunger strike to release all Ukrainian political prisoners, it’s worth thinking about how to expand the field of solidarity. On 13 July, Oleh Sentsov turned 42. He is currently on hunger strike in a prison colony in the Russian town of Labytnangi, beyond the Arctic Circle. I heard about this place only after Sentsov was imprisoned there. He is being kept alive on an IV of glucose and amino-acids, which is an especially dangerous method that could result in his death at any moment. If Sentsov survives, it is almost certain he will be an invalid for the rest of his life. I’m roughly the same age as Sentsov, and I can’t get it out of my mind that if it had been my fate to be born in Crimea and not Kyiv, then its more than likely I would have ended up like him or at least in a very similar place. After all, Russia’s occupation regime doesn’t give a damn about Oleh Sentsov or Olexander Kolchenko or any of the other dozens of Ukrainian political prisoners. These prisoners are being punished in order to show that Putin’s regime will respond with repression to any attempt to oppose the occupation of Crimea. The FSB will apply excessive and unjustifiably brutal violence against anyone who lifts their head. True, intimidation can’t be effective indefinitely and opposition protests in Russia (including those against the pension reform) demonstrate that. However, opposition to the annexation of Crimea is the one thing the FSB does not tolerate. In contrast to Nadia Savchenko, to release Sentsov means to recognise at least the moral right of Crimeans to oppose the occupying power. And that already puts in doubt Russia’s entire imperialist expansionist strategy and the legitimacy of Putin’s regime as a whole. Sentsov was one of the Maidan activists in Simferopol. There were all kinds of people there, including of course far right, who, it must be said, quickly disappeared as soon as “the little green men” appeared in Crimea. Sentsov deliberately stayed on so as to oppose the occupation together with the Crimean democratic socialists and anarchists from the Student Action union. Many of them were and still are my personal friends. Most of them managed to leave when all legal avenues for protest were exhausted and the arrests began. However, one other person among them, Olexander “Tundra” Kolchenko, was also seized by the FSB and sentenced alongside Sentsov to a long term in prison. 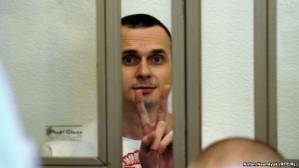 Oleh Sentsov, a person of democratic and anti-fascist views, was sentenced together with Olexander Kolchenko, a left-wing trade union activist, anarchist and anti-fascist. The complete absurdity of the “terrorism” accusations against these men, who were allegedly part of the far-right Right Sector group, is patently obvious to any observer not already prejudiced against them. The cynical falsehood of these charges (according to which Russian anarchists are also currently being prosecuted) brought against them in a show trial was intended to frighten off everyone from participating in any independent social activism on the annexed peninsula. As hard as they tried, the FSB could not fabricate anything that sounded convincing. Even from the materials presented, if one is to believe everything that was written in them, it is clear from the FSB’s own version that neither Sentsov nor Kolchenko ever planned any terrorist acts that could endanger human life or health. If that was “terrorism” then it was infinitely more humane than the entire Russian state with all its rights ombudsman. There is real terrorism in the world, the kind that is directed against unarmed and peaceful people by ISIS fighters who drive into crowds of people with trucks, by Russian army units who fire Grad rockets into the residential neighbourhoods of the Ukrainian city of Mariupol. To the question “Who is Sentsov?”, I can give a simple answer. Sentsov is a symbol of the just struggle against foreign occupation and imperialist oppression, a personification of humanism devoid of ultra-right nationalist xenophobia. Right now he is a symbol of the fact that even when the state has betrayed you and you are forced to yield to its irresistible violence, even then you have a choice: the choice to remain a human being, not to renounce yourself, not to forget about solidarity with others. Sentsov keeps emphasising that he is demanding justice not for himself but for the many political prisoners being held in the prisons of the Russian state. We can only hope that Sentsov will not have to pay with his own life for the right to remain a human being. Shouldn’t we express our solidarity with people who are not afraid to challenge a cynical occupation regime? To stand against a regime that at this very moment uses machine guns and armoured personnel carriers to put down mass protests by Crimean Tatars and other pro-Ukraine activists? Against a regime that has just shown that it will not tolerate any public or legal opposition? I don’t doubt this whatsoever. Those who will not unconditionally support the immediate release of Sentsov can only be people who, consciously or unconsciously (which makes it no less disgusting) justify imperialism and tolerate the subjugation of one nation by another. Right now these people are justifying Russian imperialism, and tomorrow they will find similar arguments to justify German, American, Chinese and any other imperialism which best satisfies their opportunistic interests. True, there are also political prisoners in Ukraine. Political repressions are intensifying in this country. It is quite possible that as the election season grows nearer, we will see at least some attempts to organise far-right pogroms not only against Roma, but quite possibly also against independent trade unions. It is imperative that the workers’ movement effectively counters attempts by the Ukrainian security services, the Ministry of the Interior and different oligarchic groups to intimidate and direct far-right terror against left-wing and trade union activists. Building a movement capable of halting the advance of authoritarianism in the country will be possible only on the basis of genuine and practical solidarity: between the metal workers and the railway workers, the miners and transport workers, between all the workers’ organisations and movements. Furthermore, in terms of solidarity with Russian workers suffering under Putin’s regime, we must demand the release of political prisoners in Russia and Ukraine. Not only are there Ukrainians, but also Russian citizens who are repressed for taking part in democratic and social movements or simply as a result of their oppositional convictions, who are languishing in Russian prisons charged with terrorism and extremism. Taking this kind of position gives us an indisputable right to demand the immediate release of political prisoners and a halt to political repressions in Ukraine. The intimidation of trade union leaders and the efforts of the Ukrainian security services, which follow the example of the FSB by concocting criminal charges for postings on Facebook – all of this weakens Ukraine. It is a dangerous illusion to assert that a liberal consensus has been supposedly achieved in this country, while it is effectively supported with targeted terror carried out by far-right groups against the left. In actual fact, social tension and the polarised inequality of wealth in society continue to grow stronger, while the plunder of our country by the oligarchs goes on. Alongside this, the mechanisms for social dialogue are being systematically destroyed: from “cleaning out” the left wing of politics, the ruling class has moved on to the gradual elimination of trade unions. In the prevailing conditions of continuous pressure by Russian imperialism from one side and western imperialism from the other, Ukraine will hold together only when we bring to a halt the oligarchs and their entire army of bailiffs from the security services, the Interior Ministry and all the far-right groups put together. Does anyone really expect that the oligarchs, who themselves built a system of corruption and plundering of the state through their offshore platforms, will themselves put a halt to it and start to develop the country, rather than their riches overseas? Are we capable of stopping the oligarchs? Is that not as hopeless as Sentsov’s hunger strike and his demand to free all political prisoners in the Russian Federation? No, neither of them is hopeless. Because we are not alone and nor is Sentsov. Only by organising themselves, can the workers of Russia and Ukraine put an end both to the grasping imperialist politics of Moscow and Ukraine’s insatiable oligarchy. It would be incredibly short-sighted not to see that the workers’ movement remains the only social force capable of withstanding the advance of totalitarian obscurantism. The recent action by Ukrainian railway workers demonstrated before our very eyes that it is workers (and not IT specialists) who remain the only people who can halt the locomotive, and in a quite literal sense bring to an end the removal of untaxed wealth from the country into offshore accounts. A poor understanding of these elementary economic facts is unfortunately quite widespread among Ukraine’s progressive liberal intelligentsia, who continue to dwell in the mental world of postmodern, post-industrial superstitions of the 1990s. The case of Sentsov and Kolchenko is clearly political, and it is being utilised in the most disgusting political games. However, these games cannot change its essence: the right to struggle against imperialist violence for the dignity and freedom of the oppressed. A political struggle that will continue and, I hope, will end in the common victory of Ukrainians and Russians. Translated by Marko Bojcun from Social Movement’s website. Republished from Open Democracy.